If you had to simplistically categorize the music of Nick Cave, the words "happy" and "upbeat" wouldn't likely come to mind right away, hell, if at all. Rather, the music of Aussie-born Cave (and his current band, The Bad Seeds) is more apt to conjure up feelings more akin to "gloomy," "dark," or "somber," but even those feelings are not accurate all the time. While maybe not exactly household names in the States, Cave and The Bad Seeds (as well as his earlier band from the early 1980s, The Birthday Party) have established themselves as unique purveyors of wonderfully intricate and emotional music, darkly intense creations punctuated by Cave's sometimes gentle, sometimes thunderous piano work, with his deep rumble of a voice spewing tales of woe, misery and lost loves. On this concert disc, recorded before a wildly appreciative crowd on June 8th, 2001 at Le Transbordeur in Lyon, France, the full, sweaty glee and near religious fervor of a Nick Cave concert can now be experienced by the masses, and though this is likely geared toward the faithful, any adventurous music fans willing to drop the obscenely cheap fifteen bucks or so it would take to buy this DVD will be rewarded in spades. Cave, attired nattily in a simple black suit, with ever present dangling cigarette, undulates and gyrates around the stage as if he is about to begin speaking in tongues, and as Warren Ellis saws madly on his violin the dual guitars of Mick Harvey (a holdover from The Birthday Party lineup) and Blixa Bargeld just add to the slowly percolating and incendiary mix. The band belts out a healthy cross-section of material from their catalog, though at a scant fourteen songs the set in retrospect seems amazingly brief (despite running a full 90 minutes). More familiar pieces like the chime-heavy chilliness of Red Right Hand (used on The X-Files to great success) are nestled in between newer pieces like As I Sat Sadly By Her Side, and a quick glance at the set list might look more like the music from a gothic tent revival meeting (Oh My Lord, God is in the House, The Mercy Seat, Hallelujah). There is more than a wee bit of unmistakable religious intensity in Cave's performance and mannersims, to say nothing of the crowd's adoration; he sings, croons, howls, and emotes, drawing the crowd along with him down all manner of shadowy, and not always redemptive, paths. It should also be noted that God is in the House is also one of the last recorded Bad Seed shows featuring guitarist Bargeld, who has since left to pursue work with Einst�erzende Neubauten, and when he and Cave do the question/answer vocal thing on the swirling dirge of The Weeping Song (which is "a song in which to weep", in case you were wondering), there is more than a bit of bittersweet irony, or at least there is for Bad Seed fans. Image Transfer Review: Does a fairly grainy image transfer of a Nick Cave concert add or detract from the potential enjoyment? I'm torn, really. This is not a crystal clear print, by any means, and this roughly 1.85:1 nonanamorphic widescreen transfer has a steady amount of grain and the occasional blooming stage lights. But luckily, this is a Bad Seeds show we're talking about, and though some segments looks noticeably sharper and crisper than others, the general haze and grain almost seem to add an intentionally dramatic layer to the overall mood, in some weird way. Would I have wanted a sharper, clearer transfer? Yes. Is it tolerable? Yes. Audio Transfer Review: The 5.1 surround track found here is an impressive one, and yet pretty typical of most concert discs in that audience sounds are relegated to rear channels, with vocals and music spread across the front three speakers, while the sub provides a steady dose of that much needed low end (a key element of Cave's music). Separation and clarity of individual instruments is nicely done and noticeably clear, and the overall presentation, while not flawless (some of the high end mix gets lost once in awhile) is more often than not outstanding. And speaking from experience, I can tell you that it sounds excellent turned up very loud. A better-than-average PCM stereo is also provided. Extras Review: If you have any interest whatsoever in the layered process of what goes into recording a song, then the John Hillcoat-directed feature No More Shall We Part The Recording Sessions (37m:25s) will come as an educational, no frills treat. Shot inside the hallowed halls of Abbey Road Studios, this narration-free piece follows Cave and the rest of the Bad Seeds over an indeterminate amount of time as they struggle and refine elements of new material as they work to lay down tracks for their 2001 No More Shall We Part release. Also included are three dark and moody (and seldom seen) music videos (in 2.0 stereo) for As I Sat Sadly By Her Side (04m:39s), Fifteen Feet of Pure White Snow (04m:29s), and Love Letter (04m:04s). All three are properly somber, but the real standout is the chaotic slo-mo dancing featured as part of the slowly building fury that is Fifteen Feet of Pure White Snow, all driven by Cave's repeated commands to "raise your hands up into the sky", growled so that it sounds not so much like a gentle urging but rather as a fire-and-brimstone exaltation. Manic, wonderful and a real favorite around my house, my daughter Sam has been know to lead the house in a loosely choreographed re-creation. Makes me kinda proud. The disc is cut into 14 chapters, or 1 per song. 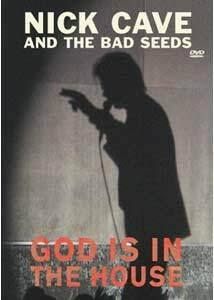 This 2001 Bad Seed concert, one of the last recorded live performances to feature long-time Cave collaborator Blixa Bargeld (before his departure to other projects), is a draining, emotional powerhouse, dominated by Cave's manic street preacher baritone swagger. As musical expression, it is churning, brooding and sweetly grim, balanced by moments of genuine beauty. The image quality is a bit on the grainy side, but a solid 5.1 surround mix more than makes up for it. Was it rock star bravado to title this release God is in the House? No, sir. It's just truth in advertising. Can I get a witness?